Accommodation: own tent during the trip (5 € a person a night) or cottage (10 to 14 € a person a night). – Cash withdrawal with Visa is expensive. The attentive reader will notice that above Conca – Calenzana is stated and not Calenzana – Conca. Those who have done their homework should know, that there are no sensible argument to make this trip from north to south. Most guided groups walk from south to north. 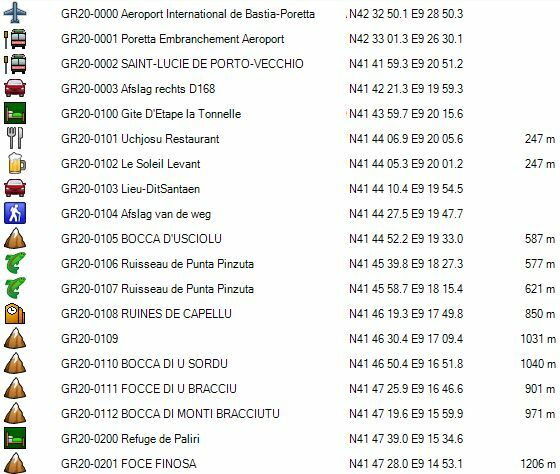 Only the poorly prepared individual hikers walk from north to south, because most guides on the GR 20 are described in the that direction. Even those who just want to walk the northern half are in my opinion still better off to leave at Vizzavona instead of Calenzana. – You have the sun on your backside. – You have the wind in your backside. – It takes more days to reach the 2000m altitude threshold, so you can acclimatize better. – If you do the complete tour, you tackle the first the southern part with the least number of supply points and therefore your pack will weight down more rapidly. – You will tackle the technically most difficult part of this trip (Cirque de la Solitude) only when you are fully acclimatized and your backpack is at its lightest. – You will do many steep climbs and usually gradual descents, which is technically less dangerous than a gradual climb followed by a steep and therefore dangerous descent. It is also better for your knee joints. A steep climb is only difficult for your heart and respiratory system, but if you suffer from this, you do not belong here. – You save the best part for last. You will be well acclimatized and therefore will be able to fully enjoy your trip. I myself have made this tour as a solo tent hiker, with only limited logistical support in the form of the purchase of bread, cheese and jam along the trail. But you must prepare it perfectly. The better your physical condition at the departure, the greater the chance will be, that you can enjoy your trip. Getting older, I’m getting more and more convinced of the necessity of a good physical preparation. Walking in rolling country is good, but the feel of a non-stop climb or descent of over a 1000m, you can’t easily substitute. For this trip I lost 8 kg in body mass, for the simple reason that you don’t only carry every pound of equipment in your backpack, but you must also bear every kilogram of overweight. And so I have brought my BMI to under 25 and this will remain at this level from now on. During and immediately after this trip, I lost another 3.5 kg. – Shoes: boots of the type B or C (La Sportiva Evo Trek) preferably from a known brand and preferably in combination with a layer of Gore-tex. – Set of spare clothing (shorts with your spare T-shirt) to wear in the cabin and cabin slippers. In most lodges you can’t enter in your hiking boots, but the floor isn’t sufficiently even, to just walk around wearing only socks. Being a tent hiker, I did not bring sneakers. This saved at least 450g. For such a trip everything counts. I started off with a dry backpack weight of 17 kg. – Telescopic walking poles (relieves the pressure on the knees, when descending). It is advisable to buy poles of well known brands: Leki, Komperdell or Black Diamond, with Decathlon as a cheaper alternative. Pay attention to the material of the handles (no hard plastic) and eschew particularly sticks with a buckle in the hand strap. Prolonged use will irritate your hand at the buckle. – Backpack of 60 liters (Quechua Symbium 60 fromDecathlon). Despite the fact that the backpack comes with a rain cover, I always put everything in plastic bags closed with a metal clip. Small gear and daily rations go into freezer bags from Aldi. – A sleeping bag with a comfort temperature of 0 to -5 ° C. Even cabin hikers should bring a decent sleeping bag, since you run the risk of having to sleep in a Decathlon 2’ tent type, if the cabin is full, due to a large influx of lodge hikers. Also bring along a light plastic sheet the size of a sleeping mat, since not everything is as clean as it should be in those tents. You shouldn’t bring a Thermarest, because it is available in the rental tent. – 1 towel 50 x 30 cm, preferably in micro fiber (dries faster and carries less odor, when not dried properly. Already available at Aldi). – 1 small bottle with a shower soap and shampoo, a washcloth, a small travel toothbrush with toothpaste (you can also save an almost empty tube for travel), a stick of shaving soap and disposable razor blades or an electric travel shaver on batteries. – A few packets of paper handkerchiefs, does double duty as toilet paper. – Micro Headlamp (Petzl Tikka Plus 2) to find your way back to your tent in the dark. – Personal pharmacy: bandages, sterile gauze, antiseptic, wound plasters, scissors, sports tape, Compeed, ibuprofen, paracetamol, Rinomar (for runny nose) Immodium (generic: Loperamide for diarrhea). – GSM (network coverage not assured) or Thuraya satellite phone for those who can or are willing to pay for it. 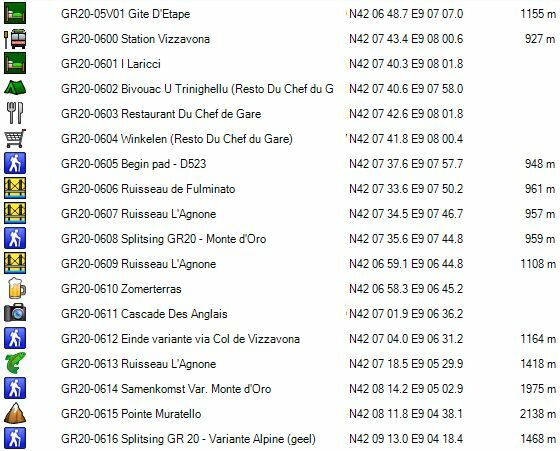 Note 1: The entire GR 20 can be found on Garmin’s City Navigator. The trail is not identified as such, but just indicated as unpaved road. By comparison with topographic maps you’ll figure it out (see also maps in the article). 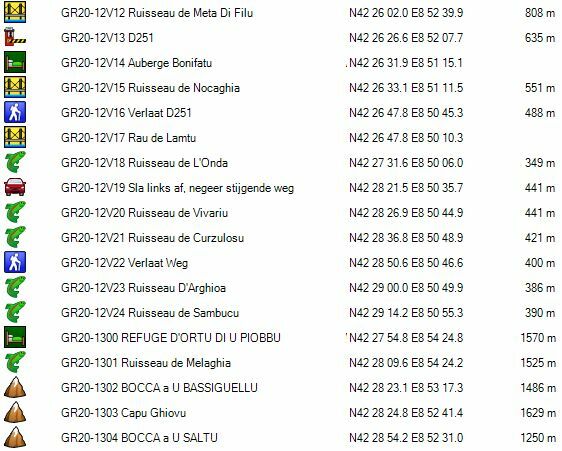 Note 2: GR 20 as a whole is well marked according to French southern standards. Only the third day there were some problems, but the park rangers are informed of this problem and I assume that this problem will be solved by 2010. Day 1 and 2 were completely redone in 2009 (really beautiful work). – Waterproof compression bag (Sea to Summit, Large) to protect the sleeping bag, given that I wore out on the outside of the backpack, because of its size (28 €). According to the nutritional theory, your meals ideally should contain a ratio of 15% protein, 30% fat and 55% carbohydrate. For some sports, you can go up to 70% carbohydrates. However, please keep in mind that fat contains more calories for the same weight. I put my daily ration for each day on the trail in a separate plastic bag. If it rains, I put that bag in the spot where I normally put my rain trousers (side pocket), so that the backpack shouldn’t be opened all the way, when you want to supplement your energy level. I, myself, weigh about 73 kg. Those who are heavier build, will need more food. A menu must be sufficiently varied and must of course be acceptable for you. However, know that when I am at home, I eat more varied than this. Many sports bars already state their composition on the packaging. If you do not find it on the packaging, you will need to use a general list of the nutritional composition of different food types. These can be found in a book on dietetics in the library or on the internet. If you know that 1gr protein corresponds with 17 kJ or 4kcal, 1 g fat with 38 kJ or 9 kcal and 1 g carbohydrate with 17 kJ or 4 kcal, you can calculate it yourself. Energy bars, can be found once a year at Aldi (Isostar, but without the brand on it), Isostar can be found at Makro or sports shops. Foré (fake Snickers) can be found at Aldi. Buy hard muesli bars, not the soft variety, because they’ll crumble easily when being stored in your backpack. Otherwise you’ll need to keep them in a box which, adds extra weight. Because I was counting on rather sunny weather in view of the southern location of this trip, I had only 2 of the above mentioned daily rations packed, as a sort of strategic reserve. I also packed 7 freeze-dried meals for 2 people, which made me less dependent on potluck or cans available at the lodges. The greater half of each freeze-dried meal, I prepared in the evening for supper. The other half was prepared as breakfast. A package for two persons weighs approximately 210 to 260 gr. and contains approximately 800 to 1000 kcal. The brand with the largest choice in freeze dried meals available in Belgium at this moment is Trek’n Eat (www.trekneat.com) , a sub brand of the Katadyn group (www.katadyn.com) , mainly known for their water filters, but also through their Optimus stoves (www.optimusstoves.com) . Other brand are Mountain House (www.mountainhouse.eu ) and Adventure Food (www.adventurefood.com ). Please note: in some brands you will find between the food a bag (or two 😦 ) of silicon powder to absorb the last bit of moisture. Remove this silicon bag before you add hot water in the main bag or better poor the contents in your cooking pot. A bit more cleaning work afterwards, but it rehydrates a lot better. On storms in Corsica, I want to say that if you see tower clouds coming in from the sea towards the mountains in the morning and you don’t hear any the rumble or thunder at around 11:00 am, it will only rain at night, as was the case during the first 2 days. If it rumbles at 11:00 am, you will get rain and thunder at around 2:00 pm hour. So in those cases, you better make sure that you are off the ridge of the mountain, preferably somewhere underneath the tree line or best of all: in your tent at the end of your stage. So starting as early as possible is the best advice, to avoid problems with afternoon thunderstorms. With Jetairfly (SN Brussels Airlines) from Zaventem to Bastia. Check-in time at 1:00 pm. Arrival: 2:55 pm. Luggage of the conveyor belt: 3:30 pm. Walking to the N193 at speed march tempo 35′. You will find the bus stop at the roundabout turning right towards a parking lot between Total and Carrefour. There is a bus cove beside the road, but no other sign indicating a bus stop. Foreseen arrival time: 4:20 pm. Actual arrival: 4:30 pm. Coach: Les Rapides Bleues and so you have to wave down a blue bus. At the front window you’ll notice a sign with big but faded letters indicating: “Bastia – Porto Vecchio”. Pretty old bus (fast, it was in a far and distant past), driven by a woman with a male companion for the luggage and postal parcels. Price: 17 € to Saint Lucie, plus 1 € for luggage. Arrival: 6:35 pm instead of 6.20 pm. You recognize Saint Lucie by a round tower on a spur from the last beach along the costal road. The road goes inland a bit after a bridge over a river, before you reach the center of Saint-Lucie. 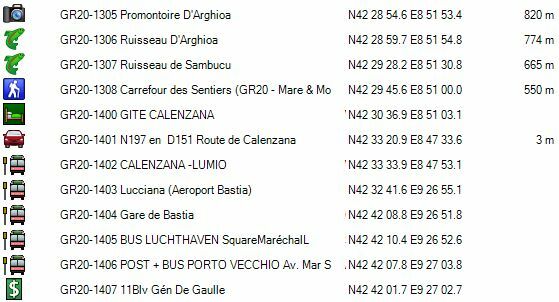 If the driver knows that you are on your way to Conca (and most people with large backpacks on this bus are 🙂 ), they will drop you off a 100 meter before the turn off towards Conca. The official busstop is at Bar u Colombu, 200 meter beyond this side road to Conca, in the direction of Porto Vecchio. 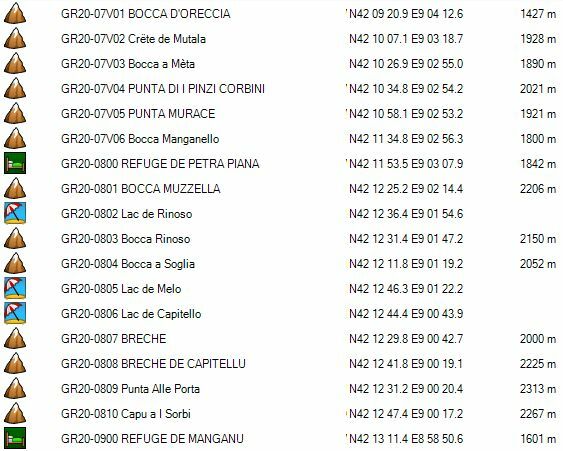 You hit the road (GR20-0002) to Conca. Initially you’ll find a kind of pavement. Outside the village there is a ground-up which you can use until you reach to the actual road (GR20-0003) climbing towards Conca. Here you turn right (well marked) and the road begins to climb steeply immediately in hairpins to the top. This is followed by a long horizontal part. The beginning of Conca is characterized by the graves, located on both sides of the road. You’ll also find a place for mobilehomes, garbage bins and a water tap. Just before the sign “Conca” you’ll find on the right side of the road a mini-campground for hikers and a lodge: Gite “La Tonnelle ‘(GR20-0100 – Arrival 7:50 pm). You leave the lodge toward the right in the direction of the church. You go right of the church. At a pub (GR20-0101) the road makes a 90° turn and at the next pub/lodge (GR20-0102) you will find a sign indicating the GR 20, where you turn to the right. You climb along the asphalt road until you reach the last houses of the village. You leave the road in a hairpin bend (GR20-0103) where you find the real beginning of the GR 20. You descend a few meters to a dry riverbed and then it goes straight up towards the Bocca d’Usciola (GR20-0105). In 2009 a bush cutter had been used to reduce the vegetation. This is not the case everywhere and so I still prefer to wear long trousers. I really enjoyed the Mammut Schoeller Dry Tech, but it comes at brand prices. Cheaper alternatives are available from Decathlon. At the Bocca, you literally crawl between two rocks and you’re away from civilization. Then follows a horizontal stretch, followed by a steep descent towards Punta Pinzuta (GR20-0106), a nice spot for a first break. After the river you tackle a climb. Higher up, you cross an almost dry river bed (GR20-0107) again and then a piece of forest. You continue to rise towards the Ruins of Capeddu (GR20-0108). The tree vegetation and therefore the sun protection becomes thinner. Ultimately, are you reach rather suddenly the Ruins of Capeddu. Here you will find indications towards a well at 300M (pale yellow markings, unchecked). You can also find traces of camping activities, despite the prohibition to do so. In case of emergency you can find an emergency shelter under a steel roof at the base of the ruins (Height about 80cm). From here it goes up to the Boca di Sordu (GR20-0110 – 1040m). Then follows an unpredictable stretch of trail until you finally reach a kind of pass. Here you will find a sign indicating the Paliri hut 30 ‘, but it takes you less time. You only have to climb towards the saddle and suddenly you see the first tents of the campsite. A bit further you will find the small cabin of the Gardien (Caretaker) and hidden behind a rock you will find the actual hut for hikers (GR20-0200 – 20 beds). Because of the rain the hut was crowded and it was dark. The toilet and sink are situated somewhat lower. Drinking water should be fetched from the well along the path towards the Foce di Bavella. Slightly lower you can also find a primitive shower. The campground is very spacious. I found a spot next to the kitchen area for campers. The supply is limited: some pre-packaged sandwiches, salami, some cheese and especially Pietra (beer) cans and wine. I do not think there is a real meal available. The first part is harder than you might expect, and above all the only part that you absolutely don’t finish within the specified time of 1:20’. You start with a descent through the forest. Then follows the steep climb to the Foce Finosa (GR20-0201), followed by the descent towards the river Vulpajola, at a gravel road (GR20-0202). You can camp here, but because it is forbidden, this is checked upon by the park rangers, who don’t arrive here before 9am ;-). After a short stretch of gravel road, you leave it again (GR20-0202A) for a path climbing towards the Foce di Bavella (GR20-0208). Once back on the gravel road, you can find a well (GR20-0205) along the side of the road , some 10′ before reaching the pass. After reaching the Foce di Bavella, you find yourself awkwardly single in a tourist fair. There is a commercial lodge (GR20-0204) and restaurant, which I did not use. And the shop focuses more on tourists than on hikers (no bread). Once on the road, go left towards a parking area to the left of the road. Here the path leaves the road to the right (GR20-0207 – right). The first signs are vague. Against the slope you will find the Alpine Variant, marked with double yellow stripes. Since there were already signs of an approaching thunderstorm, I opted for the lower normal route. People who have done it, said it is very beautiful. If you depart from the south, he weight of your backpack is also an argument against the Alpine Variant. Shortly after the junction the path of the GR 20 descends and here you must be careful, because at the beginning the path is a little vague. The trail runs in the side of the mountain on rocky terrain. Later the path becomes clearer, but it is much harder than what you would assume to be a simple part, because it is slightly downhill. From the Replat de Pulvara (GR20-0212) the path is much more pleasant, despite the fact that it climbs. Count on 1:40′ to the junction (GR20-0213) of the Alpine Variant. Then another hour to before you cross the brook Ruisseau D’Asinao (GR20-0215). About ten minutes before the crossing of the first tributary river, you’ll find a source (GR20-0214). After crossing the main stream, it’s still 50′ climb to the hut. This last part towards the Refuge d’Asinau (GR20-0300) seemed endless since I couldn’t see the hut, because of the fog. Refuge d’Asinau (GR20-0300) burned down on 25th March 2016. The best pitches are located just below the path towards the toilets. Watch out for the horses! Especially a colt was very wild. The Gardien says blandly that they sometimes jump or walk over the tents. Very reassuring when you get there with an expensive tent instead of the usual 2′ tents of Decathlon. If the cabin is full, you will have to sleep on a Decathlon Thermarest, in one of the 2′ Decathlon tents, which are pitched there for the season. So bring a sleeping bag that is sufficiently thick. Menu: lentils with bacon, bread, cheese, dessert. Generator running from 4.50u until 22.00u (audible on the site). The path starts at the bulletin board on the GR 20. First thers is a bit of climbing, then a horizontal traverse towards the river, after which the path climbs steeply. It is difficult to distinguish between what the official path should be and the shortcuts. Later on, you get a lot of slanted rock plates to scale. This is a part that is easier to climb than to descend, especially when those plates are wet. Here you will find a first clear example of why I recommend everyone to walk this path from south to north. This continues until you are approximately at the highest point. 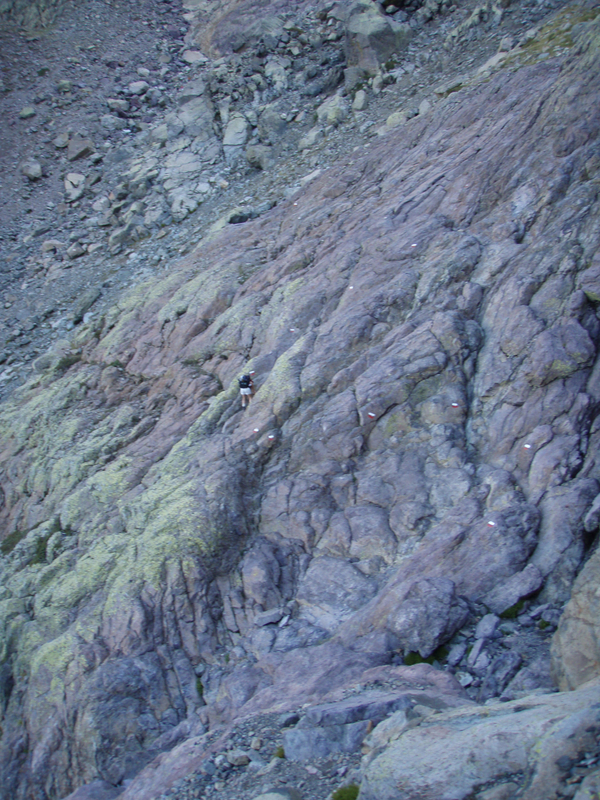 Then follows a diagonal traverse to a spur on the front of the mountain Monte Incudine (GR20-0301). 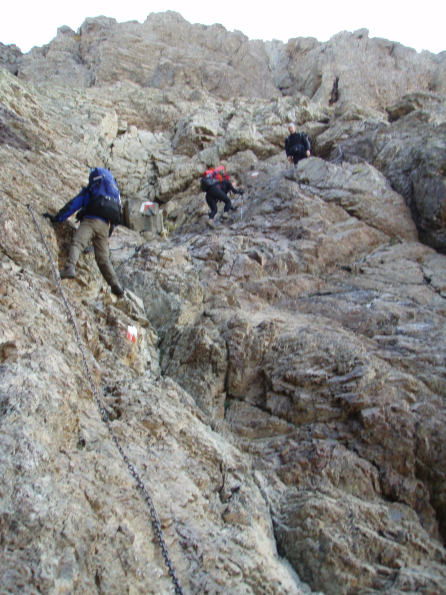 Consecutively follows a horizontal traverse to the actual pass, where the path that goes to the top, passes along the back side of the mountain. Briefly watch out to follow the path near some bushes. Here you go up towards the top. The cross on the top of the mountain isn’t standing up. In view of the clouds coming in, I did not stay long and I quickly descended. The descent is without any problems. Just below the tree line, about 400m before I Pedinieddi, you’ll find a source (GR20-0303). 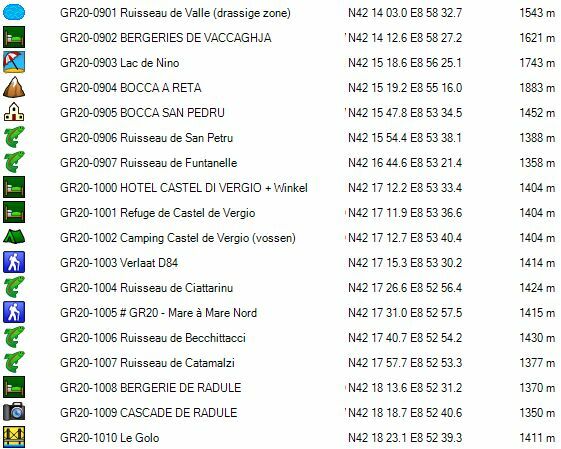 At I Pedinieddi (GR20-0302) you’ll find the only place where it is officially permitted to camp outside the immediate vicinity of the huts. Given a heavy storm was predicted in the afternoon and the total excursion time of 9:20’ according to the GR 20 guide, I decided to break off here. The storm eventually came, but in the evening and moreover the 9:20’ is exaggerated. 7:45’ is probably more realistic. On storms in Corsica, I want to say that if you see tower clouds coming in from the sea towards the mountains in the morning and you don’t hear any the rumble of thunder at 11.00 am, it only will rain at night, as was the case during the first 2 days. If it rumbles at 11.00 am, you will get rain and thunder at 14.00 hour. So in those cases, you better make sure that you are off of the ridge of the mountain, preferably somewhere underneath the tree line or best of all: in your tent at the end of your stage. So starting as early as possible is the best advice, to avoid problems with afternoon thunderstorms. I Pedinieddi: free camping site, no facilities, except source. In some reports on the internet there was mention of a refuge in the form of a giant tent in this location, but that was not the case in 2009, so do not count on it. From here on the trail goes a little up and down through a fairly open landscape. Sometimes there are few signs, because of the lack of good supports, but the path is usually well visible in the landscape. Once you reach a more wooded section, the path begins to climb and continues to climb to a well visible breach in the ridge called A Petra di Leva (GR20-0311). From here, you need to pay attention to the GR way marks. In 2009 they were vague and could use refreshment. I mentioned this to the park ranger at Calenzana, and he seemed to be aware of the situation. Hopefully the way marks are refreshed by now. The problem here is that the course of the path is sometimes very erratic. Because of the vague way marks, you need to be very vigilant and sometimes you also have to look behind the corner. At one point the path disappeas through a narrow slit, without this being well marked. Result: my French and German predecessors went searching downhill over unmarked terrain, while you just had to switch to the other side of the ridge through this narrow slit. But in 2009 this location was definitely insufficiently way marked and there were some other places where you really had to look well to follow the trail. As mentioned, I was very impressed by the quality of marking of the GR20, except for the part before and after the Refuge d’Usciolu (situation 2009). In this section you will find lots of slanted rock plates, without any kind of securing steel cable or foot braces installed, as is common in the Austrian and Swiss Alps. Good footwear and some basic climbing techniques are useful, especially in wet weather conditions. Sometimes you even have to shorten hiking poles or pass them on to your partner to get your hands completely free, to climb down of certain passages. You see the hut from afar, but count on just over 45′ before you actually get there. Well-stocked shop in a wooden chalet: Nutella, chocolate, canned tuna, canned liver paste, knee bandages (yep), etc …. P.s. : be careful with food at the picnic tables in front of the hut. The horses are real thieves of everything around them seems somewhat edible. The path goes between the cabin and the wooden chalet with the kitchen and the store. The first part is badly eroded by man and horse. After the intersection with the trail towards the valley, the path becomes better. The path is fairly straightforward, but the white-red waymarks needed refreshment (in 2009). You see the Bocca from afar, but it takes longer than expected to actually get there, because the last part before the Bocca goes up and down quite a lot. About ten minutes before the Bocca or Col di Laparo (GR20-0405), you’ll find a sign towards a source in the vicinity of a metal contruction. On your way to the source you’ll find a wooden private chalet, where you can use the terras as an emergency shelter. On the Bocca di Laparo you’ll find the intersection between the Mare à Mare Centre and the GR20. From the Bocca di Laparo you have to climb again. You can see this path partially in the side of the Punta di Campulongu (GR20-0406). Then follows a passage over a saddle and starts a section of serious climbing. You remain walking largely close to the ridge. Pay attention to the waymarks. 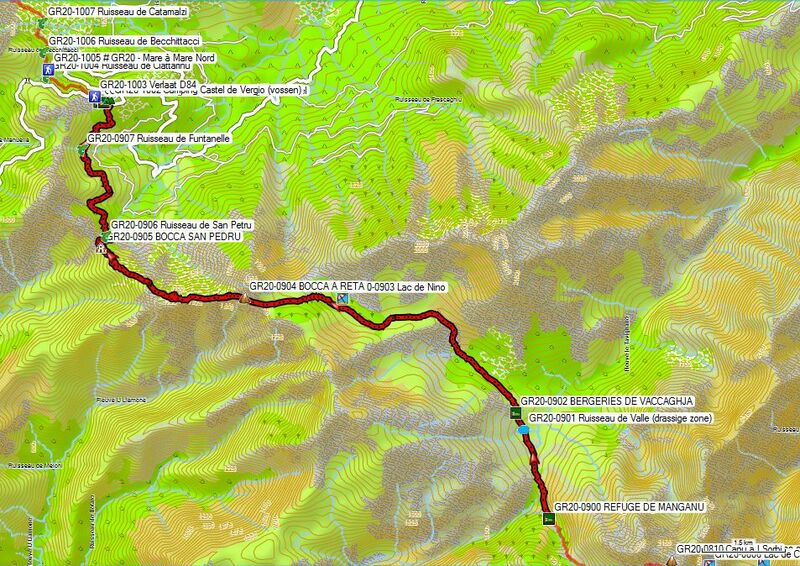 The route is somewhat erratic. There is a passage where you need to follow the waymarks between large boulders, where an actual path doesn’t exist. When you reach the ridge, the path becomes better in the side of the Punta Capella (GR20-0409). until the pass just below the summit. From here you have a beautiful view of the Refuge de Prati, but the path towards it is again harder and tougher than you might expect. First, the trail climbs a little and then follows a tricky traverse in the side of the ridge, with lots of climbing up and down between bolders and slabs, where your hands sometimes come in handy. Eventually you reach the flat part of the meadow near the hut where the path was already visible from afar. From here on you walk effortlessly towards the hut. The cabin has a large camping meadow, with real grass, but few hikers who walk the GR20 in the south – north direction will spend the night here, because of the proximity of the Bocca di Verdi and it’s temptations of civilization beckoning in the form of a hot shower and a real restaurant. Left of the hut, the trail climbs up to the plateau and then proceeds to the Bocca d’Oru (GR20-0412). From here on, follows a zigzag descent towards the tree line. Under the trees line the trail makes a wide bend along the valley wall, and eventually reaches the Bocca di Verde. This last part takes longer than you’d expect, but eventually you reach the road again with the sound of cars and motorcycles. Gite: 13 € (+3 € a person, if you wish your own chalet). Note 1: No sale of food, as mentioned in the old guide. Note 3: take your Petzl with you when you go out for dinner (autumn). It’s pretty dark around there to find your tent without breaking your legs, especially after a pint of wine. This day is long, but without any technical difficulties. You walk almost the whole time underneath the treeline, so weather is not a decisive influence. From I Capanella I had to cope with light rain. You start this trip over the gravelroad next to the restaurant and walk towards a kind of parking lots (picnic, but no overnight stay allowed). Further on you walk over a through water heavily eroded road, until you leave this for a path that climbs between the trees. 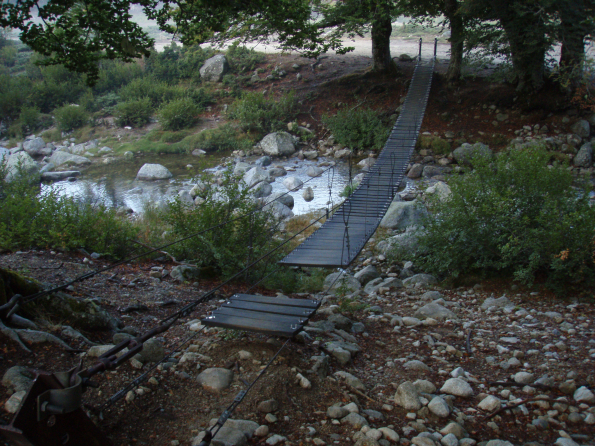 Beyond the bridge over the river Marmanu (GR20-0501 – 1410m) you will find a source along the path, which carries much sand. And suddenly you are on the plateau of Gialgone (GR20-0503). It’s an open plateau, but because of cloud coverage (fog), there was not really much to see for me. From here the path is largely horizontal. You walk in the side of the mountain, which results in the fact that you advance well. Eventually you descend, just before the road. You follow the road (GR20-0507) to the left, only for a short distance until you cross the bridge, where you start a tough climbs along the river until the seemingly deserted Bergerie d’E Traghjete (GR20-0508 –1520m). Here you turn sharply to the right in front of the building and continue to climb more calmly until you arrive just above the road towards the skiresort near the Bergerie d’E Capanella (GR20-0509 – 1586m) (1:00’). Then follows a part of rocky descent towards the road. Here you will find a restaurant with lodging, camping and a shop. The shop is certainly no more expensive than the one in Vizzavona. I bought a bread (2 €) and cheese (7.50 €/kg). The PNRC cabin Bergerie d’E Capanella is located about twenty meters above mentioned commercial lodge and has only 16 beds with limited comfort. It looks seldomly used. Only truly lowbudget hikers will stay there. You follow the GR-signs to the left of the commercial business towards the Bergerie d’E Capanella (PNRC). From here on, the path continues horizontally and parallel to the lower road towards a stretch of road that you follow downhill towards a hairpin bend. Here the GR leaves civilization, descending back down through the forest, the meters you won to reach the ski resort. Then follows again a fairly flat stretch passing by the Bergeries d’E Capanella (1586m) (1:00′), Scarpacceghje (GR20-0511 – 0:50’), “Crossroad near the Bergeries the Cardu” (GR20-0517) and the Bergeries d’Alzeta (GR20-0515 – 1560m) with distinct GR-red door and window shutters . From here you climb to the Bocca Palmente (GR20-0516 – 1640m) (1:00’) to start the long descent towards Vizzavona-Gard (GR20-0600 – 920m) (1:45’). In the forest at an altitude of about 1500m (GR20-0520), you will find a yellow-marked variant towards the Col de Vizzavone. 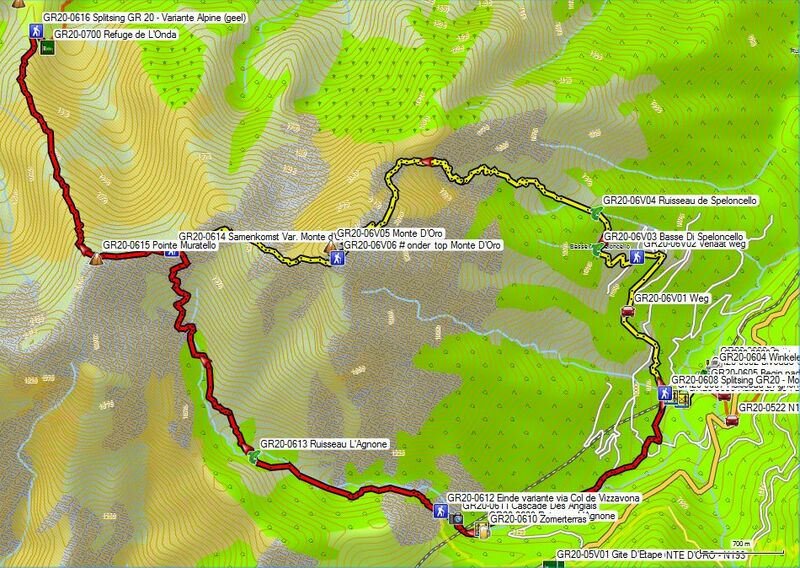 Using this variant you descend 200m less and save 200m of additional climb, the next day. 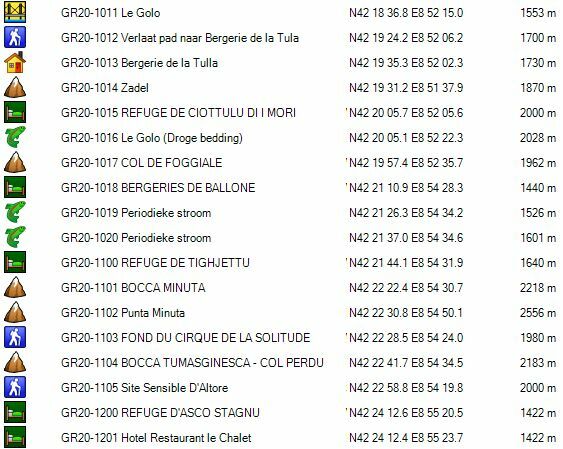 Using this variant however you will be bound to the hotel restaurant Monte d’Oro (GR20-05V00) along the National Road 193. The hotel has a lodge, where you can stay overnight (14€ and half-board costs 39€ – www.monte-oro.com ). I continued to follow the normal GR 20. Pay attention at the Maison Forestiere, because the traffic on the road (GR20-0522) towards the pass is dense and drivers might not expect walkers, crossing the road. You cross the road and pass through a breach in the wall to continue further downhill via a partially overgrown dirt road towards the asphalt, which you follow to the left. Once you have passed the sign “Vizzavona Gard”, the GR waymarks will lead you to the left using a gravel road (GR20-0605 Start Gravel road – D523). In order to reach the campground and other facilities, you need to continue to descend along the asphalt road towards the actual center of Vizzavona (GR20-0600). 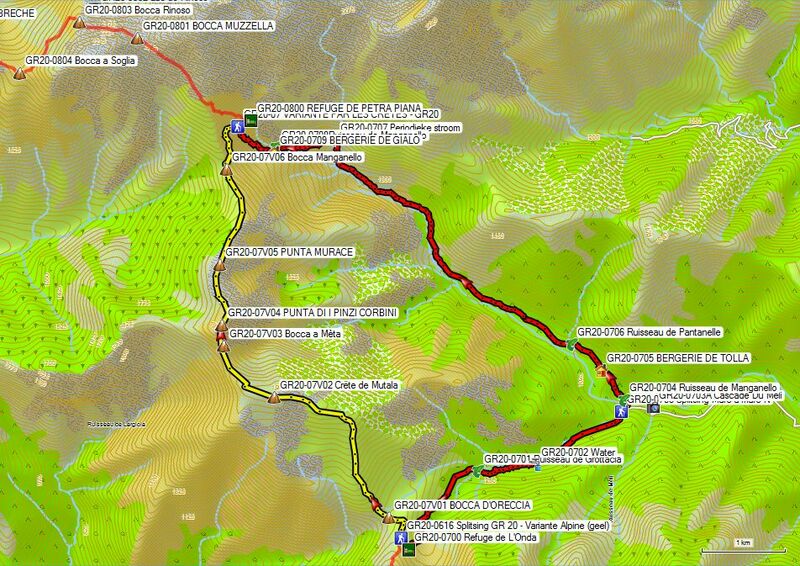 In order to get to the campground (GR20-0602 Bivouac U Trinighellu), you need to cross the railroad tracks. (Source just above the river, marked with yellow paint). Because I had read in another travelogue that the soil here was impenetrable, I bought 10 special-rock pens at Decathlon (5 € for 5 pieces, 9gr each) bearing in mind that if I broke them all, it wasn’t such a disaster, but I found the soil among the trees not significantly harder than in most other campgrounds along this hike. The campsite is owned by the stationmaster, who runs next to the station also the shop and a restaurant, all in the same building. The store is relatively expensive for its location, but that makes sense if you have a monopoly. You return to the place where you last left the path (GR20-0605 Begin pad – D523) and follow the GR waymarks, along with the many other signs towards the Cascade des Anglais. You follow the gravel road, along which you cross two consecutive bridges. You turn left and follow the river upstream. To the right you will find a path that climbs to the left in the direction of Monte d’Oro. You cut off a number of hairpin bends and cross a river twice. You continue to climb towards an intersection of paths under the top of the Monte d’Oro (GR20-06V06). From there on, you continue to climb towards the top of the Monte d’Oro itself. After the top you have to return along the same trail until you reach this intersection, where you continue to the right. You descend along the ridge towards a pass. Before this pass, you descend to the left in the direction of the intersection with the GR 20 (GR20-0614 Samenkomst Var. Monte d’Oro). For this climb you need to count on 400m of additional climb and 1km of additional horizontal distance. The normal stage is relative short and you can do this climb of the Monte d’Oro, in good metrological conditions. 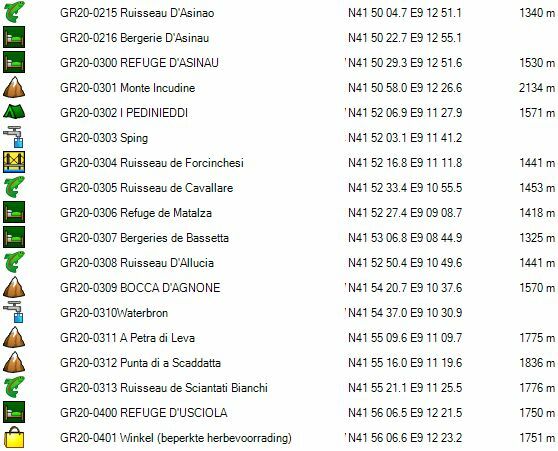 You remain longer in unprotected terrain than when following the GR 20, which is to be discouraged under unstable weather conditions. When following the normal GR 20, you turn left after the two consecutive bridges. Further on you cross a third bridge to arrive at a kind of crossroad, where you go straight ahead. The gravel road narrows to a path in the vicinity of the last benches and then slowly the climb begins to get serious. The path slaloms very hard between the many rocks in the valley near the river. Eventually you reach a bridge (GR20-0609 Ruisseau L’Agnone) with across the river a pub (GR20-0610 Summerterras), which probably opens only in July and August. Here or somewhat higher up (GR20-0612), you meet the path coming from of the Col de Vizzavone. The path continues with more of the same. Sometimes you should look carefully at the GR-marks, because it’s slightly better marked in the north – south direction than in the opposite direction. Again you have to deal with a lot of inclined slick plates, with the classic remark that it is more fun to climb them in dry weather than to descend them in wet weather conditions. It is an endless climb, because of the difficult terrain and you’re glad that you are up after 4 hours (GR20-0615 Pointe Muratello). I left Vizzavone with a little more supplies than usual, because of the repetitive stories about cabins that were badly stocked with supplies, because of the end of the season and this additional weight slowed me down in the climb. Because of the clouds, there wasn’t much opportunity to enjoy the climb. The descent down the other side went through an area marked by the erosion of the earth in a mixture of loose boulders. There is not much left over from the original path. Because of the clouds there wasn’t much to see and so you descend quickly down the hill. On the saddle (GR20-0616 Split GR 20 – Variante Alpine (yellow)) above the hut, I shortly considered tackling the next stage, but in view of the weather conditions I have wisely refrained from it. By the time I got my tent up on the meadow at the Bergerie de l’Onda, it began to rain. And it continued to rain for the rest of the night without much pause. The lawn is kept short by a good horse. The pigs and the rest of the animals are kept out of the campground by a solid fence. 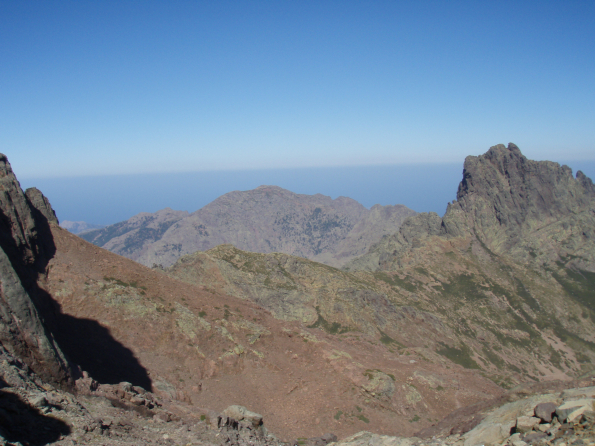 The Refuge de l’Onda (GR20-0700) is situated somewhat higher along the path. For all “services” you need to be at the Refuge. Personally, I got diarrhea possibly by a bad (not over date) freeze-dried meal or infected water (cattle) and had quite some trouble the next day. Officially this is a variant and so the trail is marked with double yellow stripes, but I suspect that there are more people who use this variant than the official route of the GR20. The advantages of this variant are substantial in good weather conditions. You will save you roughly 300m in descent and 100m in ascent. The state of the normal path (GR20) is unknown to me. I can say that the variant is difficult and partially technical in nature, despite being short. So watch out for fatigue when you want to combine this stage with another. You start with the climb towards the saddle (GR20-0616 Splitsing GR 20 – Variante Alpine (yellow)) above the hut. Then follows a short descent to the Bocca d’Orreccia (GR20-07V01 1427m). What follows then is a very brutal climb through eroded terrain to the Crëte de Mutala (GR20-07V02). Here you have already conquered the highest altitude difference. As a result of yesterdays nutritional problems, I emptied my stomach and intestinal contents, after which I stumbled on. Initially, the path is fairly quiet on the ridge, but the descent into the Bocca of Capu a Meta (GR20-07V03) you encounter the first more technical parts, which should be clambered off. 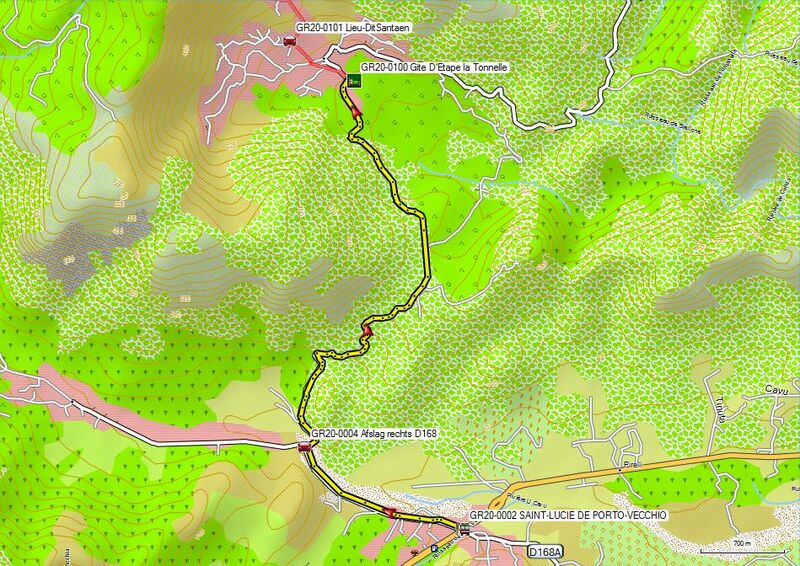 Then follows another climb to the Punta di i Pinzi Corbini (GR20-07V04 – 2021m), the highest point of this day’s stage. On the map, the sequel looks pretty nice, but in reality it’s quiet hard. There are still a couple of little annoying ups and downs on the ridge with plenty of technical parts. And also on the Bocca Manganellu (GR20-07V06) your suffering isn’t over yet, because there’s another more or less horizontal traverse with a combination of nasty bushes, sloping slabs and boulders that makes it into a real clambering stage. Never been so happy to reach the hut, after a total of five hours. Because of my illness and my consequent lack of energy, I stood very weak on my legs. I experienced this to be dangerous in the technical parts. Difficulties I otherwise deal with in a swift manner, I experienced now as very difficult because of my lack of energy. Someone in good condition must be able to cover this stage in less than 4 hours. 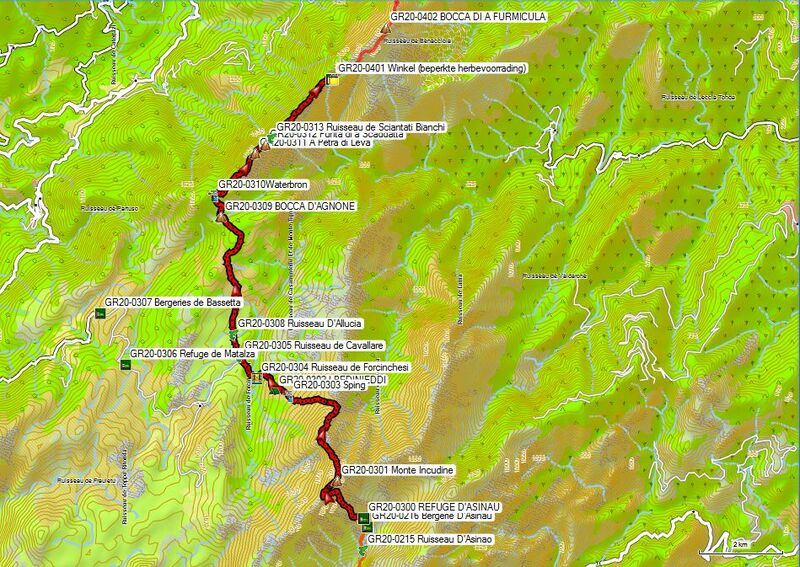 Warning: GR 20 coming from the Bergerie de Tola doesn’t pass through the Bocca Manganellu (GR20-07V06 – situation as shown on old topographic maps), but climbs directly from the Bergerie de Gialgo (GR20-0709) to the Refuge de Petra Piana (GR20-0800). Again I had to pitch my tent very quickly to deal with the afternoon rain. Menu: 18 € starter: lentils with corn, main dish: type of cassoulette: many beans with Vienna sausages. Cooking for campers allowed inside the main hut. The path starts at the signposts at the helicopter landing place next to the hut of the caretaker. The trail climbs diagonally through the bushes towards the ridge (pay attention to the GR-marks, which are harder to see because of the bushes). From here on, the path runs through more open terrain in the direction of the already visible Col de la Haute Route (topographic map – on location called: Bocca Muzella (GR20-0801)). From here on, the path continues almost horizontally and smoothly towards the Bocca Rinosa (GR20-0803 – 2150m). From here you have a view on the bowl of the Lac de Melo (GR20-0802). Then follows a fairly steep descent in zigzag, until the path continues in a horizontal traverse. You’ll find a passage with boulders, where you have to go from one rock onto another, without breaking your ankles. 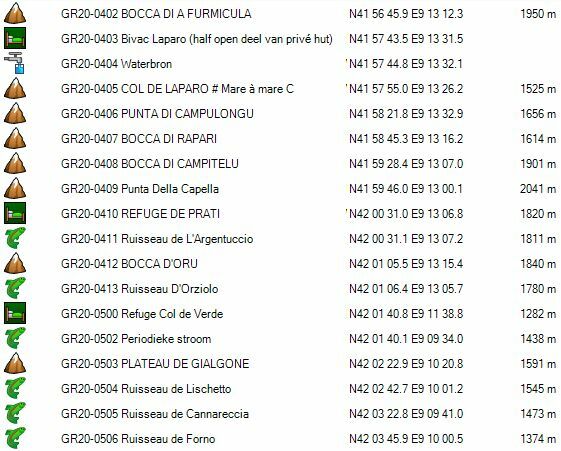 The path then follows a somewhat erratic course with some climbs and descents until you reach the Bocca a Soglia (GR20-0804). 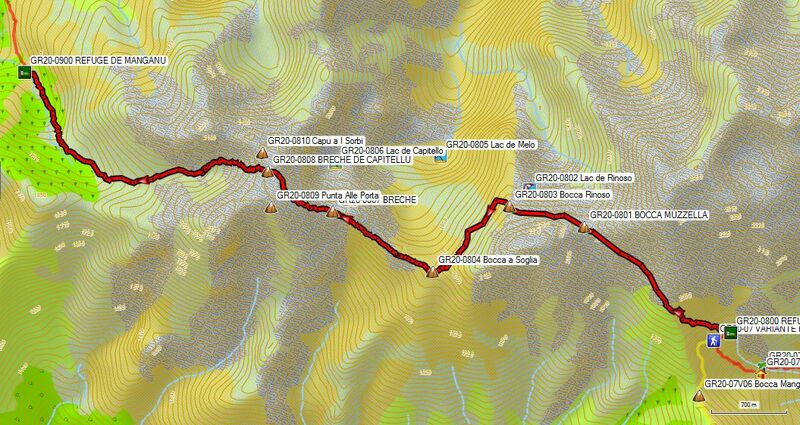 Here you will find a branch off (GR20-0805), to the Lac de Mello, the Bergerie Cave Ella and Corte. From the Bocca a Soglia you should look carefully at the waymarks. There are several good trails here, but there’s only a red-white marked. The path rises rapidly and remains close to the slanting ridge, towards a Brèche (Pass) without a name (GR20-0807). In the climb towards this Brèche, for the first time you have to deal with a piece of chain, length of about 15m, placed on a piece of rock plate, at an angle of approximately 70 °. Take the chain between your legs and walk with your soles flat on the plate and pulling yourself up on your arms (Reversed descending technique). You continue to climb towards the Brèche Capitellu (GR20-0808 – 2225m), with many stones and inclined rock plate to deal with along the way. The difference with the start of the descent in turn can’t be bigger. The terrain here is a mix of eroded soil with stone. Lower in the descent, the amount of stone increases. You’ll also find quite a few oblique rock plates, overflown by water. Therefore you should be attentive to the degree of slipperyness while descending. 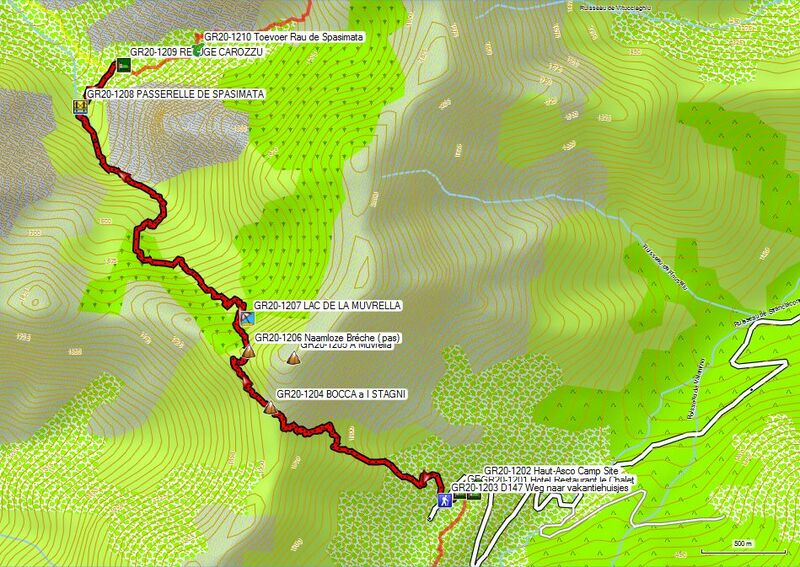 It is a long descent towards the Refuge de Manganu (GR20-0900 –1601m), which you can see only at the last moment. 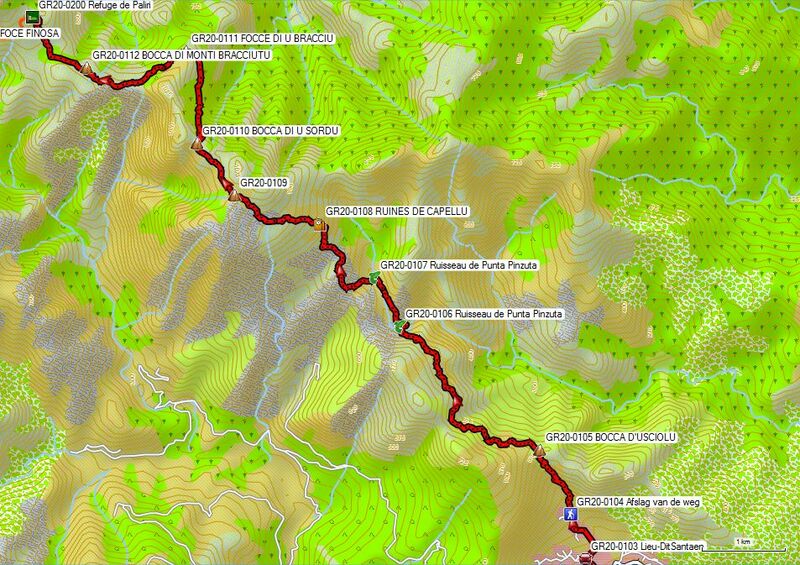 By far the easiest day of the GR 20: low altitude and few technical difficulties. One of the stables of the Bergerie de Vaccaghja (GR20-0902) you can see already from the Refuge de Managanu (GR20-0900) because of the reflection of the metal roof. The road leading there is easy with a slight drop in altitude (GR20-0901 Ruisseau de Valle (marshy zone)), followed by a slight climb towards the Bergerie. At the Bergerie de Vaccaghja groups tend to camp in Decathlon tents. The cheese produced at the Bergerie is very good. After the Bergerie, the trail goes quietly up towards the valley of the lake Ninu (GR20-0903). The trail makes a wide bend around the lake and one is asked explicitly to follow the path to protect the vegetation. Around the lake, there are horses and ponies, which are clearly not shy of people. Just before you climb to the Bocca a Retha, you’ll find a source at a brick trough. Up to this point way marks were refreshed. Higher up, they were slightly more blurred. 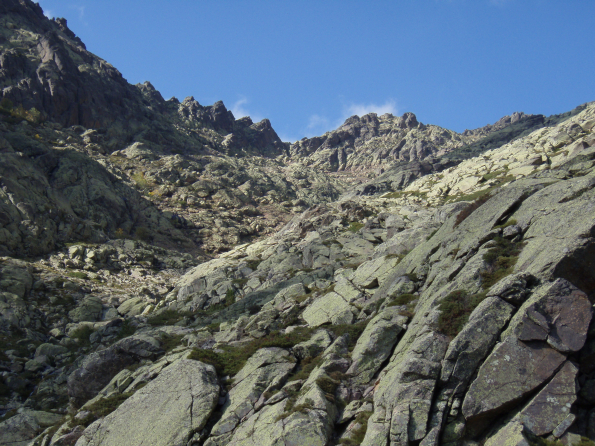 After the source, follows a climb in zigzag towards the Bocca a Reta (GR20-0904). From the Bocca a Reta you have a fine view of the coast (between patches clouds in my case). What follows is a typical example of a manmade mule trail, first in the side of the Cappu a u Tozzu, later on or just below the ridge. At one point the trail drops below the trees line in large zigzag movements. Here I found the waymarks of the trail to be a little weak, but possibly this had to do with the fact that we literally ran with our heads in the clouds, which obviously results in a reduced vision over longer distances. Later, the trail climbs back onto the ridge towards the Bocca San Pedru (GR20-0905). From the Bocca the path finally descends away from the ridge until an initially wide path alongside a wire fence. Here you go left (well marked) and from here on, you walk almost horizontally to Castel di Vergio (GR20-1000). Just below the road in view of a hangar, follows a short climb and then you are back in the civilized world. Hotel, restaurant, lodging, shopping, camping. Warning: As long as there is a sign with a warning about a fox, you better don’t camp here unless it’s very busy. When I was there, there were only two tents and during the course of the night I had at least three visits by the fox. If you already had to cope with nights filled with rain, thunder, lightning and strong wind, you’re not waiting for visits by a fox who is too lazy to go out and hunt his own food instead of trying to steal it from the tents of hikers. Especially if you have an expensive tent, you’re not waiting for damage done to your tent by such a beast. The lodge is spacious and little used and so you better choose the lodge if you want to sleep peacefully. I approached the management about the fox, but he clearly didn’t seem to understand that such a beast is a real problem. They are clearly more interested in customers who bring in more money, than the poverty-mongers at the campsite. Note: The controller for the temperature of the showers sits atop the wall of the room farthest removed from the entrance. Blue dial on top of the container with the hot and cold supply line. When I arrived the temperature was too hot so I adjusted the temperature. Menu: 23 € (Large serving of vegetable soup, grilled roast beef, baked potatoes and zucchini with peppers strongly seasoned with provincial herbs, bread, hot apple pie with whipped cream) Good, but 5 € too expensive compared to other places I ate along the GR 20. 50cl Wine: 5 € Chateau Migraine (better don’t drink too much). You follow the asphalt uphill, make a turn to the right, around the hotel and in the next turn to the left, you leave the asphalt straight ahead (GR20-1003). There are signs. Then follows a path of the type that we already know from just after Vizzavona: very erratic, slaloming between trees and rocks, and so you should look carefully for the waymarks. On a fairly open spot, you’ll find the signs of the junction with the Mare à Mare Nord (GR20-1005). And then the path continues with more of the same. Just before the Bergerie d’E ‘Radule (GR20-1008) you have a few places with a beautiful view on the waterfall (GR20-1009). Don’t expect anything spectacular, but it’s already better than the Cascade des Anglais. Just before the Bergerie, you’ll find another path to the Col de Verghio on the Mare à Mare Nord. You walk along the terrace of the Bergerie (goat cheese and drinks available) towards the bridge (GR20-1010), that you cross. Note: there are still faint signs along the side of the Bergerie up along the creek. The current route however is along the other side. There’s a mule trail that is clearly built with boulders like a Roman road. Higher up the slope, there was a foundations for another bridge (GR20-1011), to return back to the right bank again. Given the bridge was not ready in 2009, we were led slightly higher at the height of a natural narrowing of the river to cross it. Further on, you continue to climb without any problems, until you arrive just before the Bergeries de Tulla (GR20-1013), where you are sent left up the steep slope (GR20-1012). The slope and the path have suffered from erosion from the use of mules to transport the luggage of lazy hikers. The conditions will certainly not improve. Once up on the saddle (GR20-1014), you follow the path along the ridge, to pass into the side of the cirque in which the Refuge de Ciottulu di i Mori (GR20-1013 – 2000m) is situated. Over a nearly flat path you reach the refuge. No GSM coverage, the cabin is only in communication with the outside world through a transmitter. Noisy generator during the day. They have done their best to clear as many places to accommodate tent campers, but it remains somewhat limited. I also believe that this is not the busiest hut, given the proximity of other accommodation options. From the hut the path rises slightly between the rocks and bushes and then descend to the Col de Foggiale (GR20-1017 – 1962m). Then follows a technical descent with vertical broken rock plates and large step downs. Once underneath the tree line (waymarks here are somewhat vague), the trail goes up and down much until you reach the Bergeries the Ballone (GR20-1018 – 1440m) (2:20′). Overnight stay possible in a large tent. For hikers who walk in the north-south direction it is better to continue to climbs to the Refuge de Tighjettu, given the fact that this saves you 200m of additional climbing the next morning (600m instead of 800m to the Bocca minuta (GR20-1101). 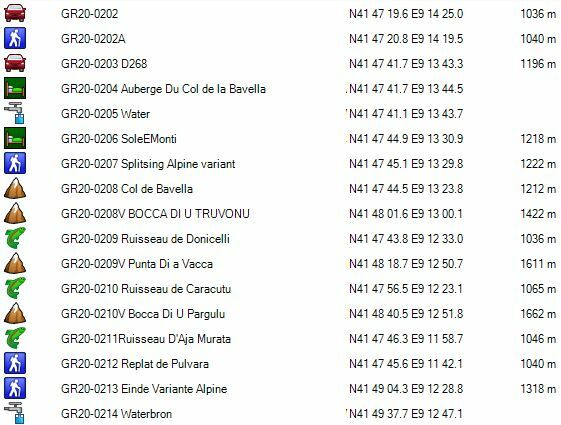 Note: as long as the route through the Cirque de la Solitude isn’t reopened you have to add 400m of altitude difference both in ascend and descend for the next days stage. The path starts at the entrance door of the Bergeries. The first signs are vague, but after a right turn and a first bump you have to climb, you can see the Refuge de Tighjettu. The climb is steep. Higher up, you will find blue signs that lead towards the hut. 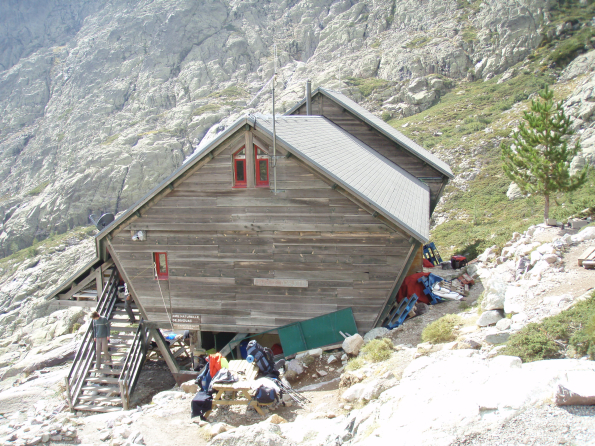 This cabin is the only one along the GR 20 which is erected not in stone, but in wood. It is a construction on piles, so that the cabin protrudes above the snow in the winter, but the quality and the maintenance leaves to be desired. The kitchenette and showers are located under the cabin, there are kitchen utensils, but the maintenance is poor (as usual). Note 1: All water from the pipes at the hut is drinkable. Note 2: first day without rain or thunderstorms. 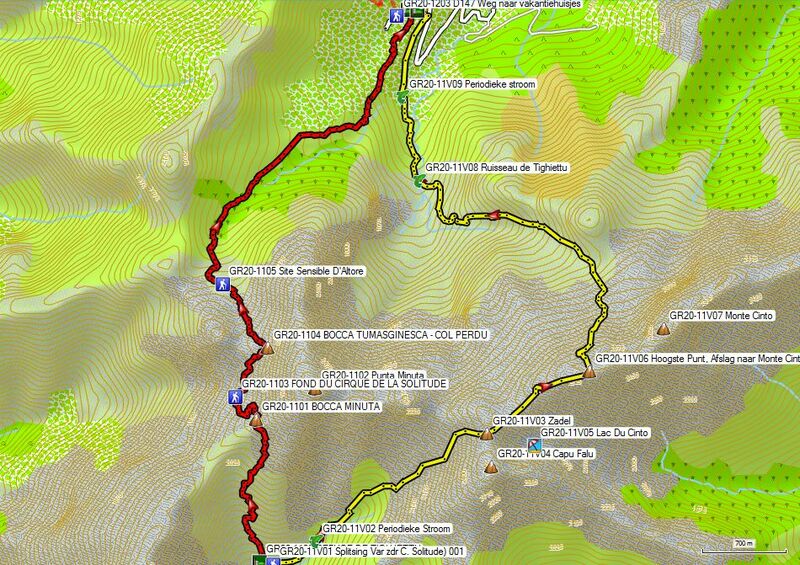 Because of the fact that the descent into the Cirque de la Solitude is forbidden as a result of an avalanche in 2015, GR has marked an alternative route between the refuges Tighjettu en Ascu Stagnu. This alternative route is marked with the usual GR white-red way marks and passes over the Bocca Crucetta through the upper part of the scree on the Cintu route. This route is said to be secured in certain parts. In the beginning of the season there is a chance of late or eternal snow on the north side of the Monte Cintu (2706m). You descend from the refuges Tighjettu in the direction of the Bergeries the Ballone over a distance of just 100m. There you will find the start of the trail through the Valle di Stagni. You follow the ridge above the main river. You cross a side river and continue to climb in the direction of a saddle between the Capu Falu (GR20-11V04) and the Punta Cruce (GR20-11V03A). You climb toward the ridge between the Punta Cruce and the Monte Cinto (GR20-11V07) and continue to climb along this ridge until you reach an intersection of paths at an altitude of 2607m. This is the highest point on the GR 20. From this point you start to descend from the ridge in scree and possible late or eternal snow in northern and later northwestern direction. 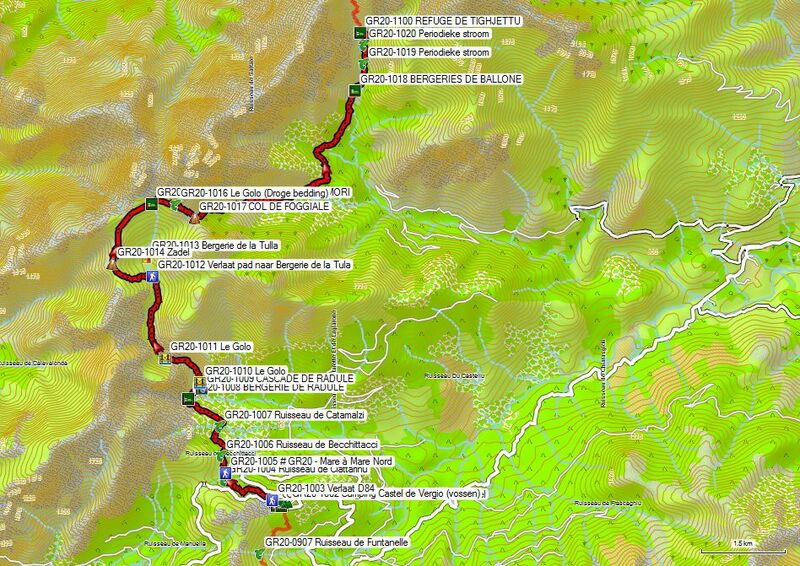 You arrive in the valley of the Ruisseau de Tighiettu, which you cross at an altitude of around 1525m. 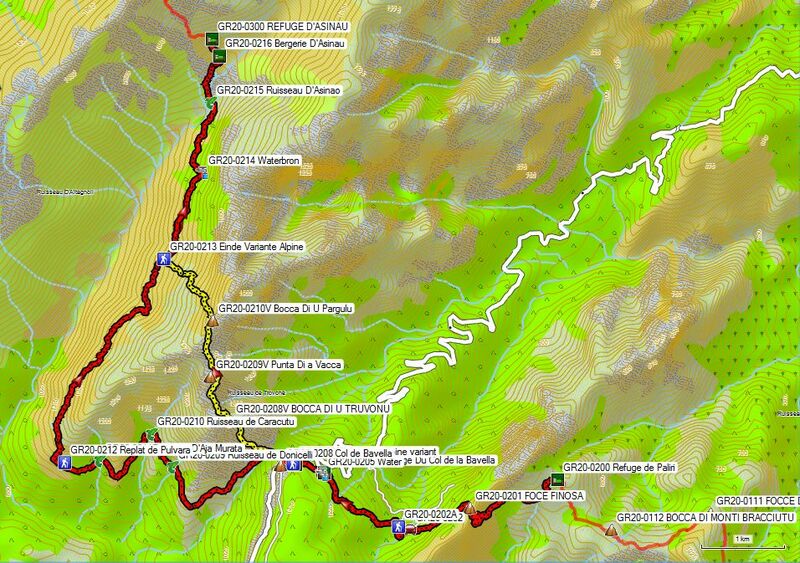 You continue to descend along the left-hand riverbank until you reach Refuge d’ Stagnu Asco (GR20-1200). 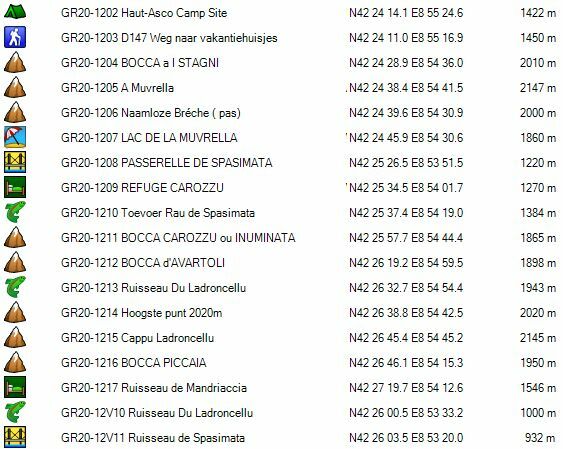 Inform yourself concerning the most recent snow conditions and other information available about the trail of the GR 20 at: http://www.parc-corse.org/ . The first part of the climb to the Bocca Minuta contains many slanted plates, which I would rather climb than descend. Higher up it changes to a path of loose stones. You can’t see the actual pass from the hut. The first part of the descent is a normal path in steep terrain on a mixture surface of earth and stone. You descend in the direction of a stone pillar, where you’ll pass right along. From here on, you better put your sticks away, because you’ll need both hands to climb and in cases like this sticks are more of a nuisance than an aid. First comes a part of horizontal traverse on sloping rock plate and then you’re at the beginning of the chain. Sometimes the chain is installed in a horizontal section, sometimes completely vertical. In that case you take the chain between your legs and pull yourself up along it, while placing your feet flat on the rock plates. The chain ends with a short ladder and then you go further down to a highly visible wooden pole (ever been a signpost?). From here it goes back uphill, first over a rock plate. Then follows a section of stone path, to finish with lots of oblique plate underneath the Bocca Tumasginesca (Col Perdu) (2183m). At this at point, I found the rock plates to be so slick and without much grip that I left the marked trail to continue to ascended through a zone with loose rock to the left of the rock plates. It is my firm belief that a chain should be installed in this section and that the total length of chain mounted should be doubled. I judge the course of this trail by Central Alpine Country standards and not by the more laidback Corsican way of doing things. According to these standards, many hikers are poorly equipped, they are overloaded in terms of backpack weight and quite often lack training in terms of climbing techniques. And then I don’t even mention people who simply do not belong here, because of a degree of vertigo which negatively affects their actions. Still, I had the good sense to walk the GR20 from south to north, so I did not have to descend this most difficult section, but could climb it instead . The section of the main chain was crowded, because of the formerly mentioned vertigo and lack of experience and so I had to wait until it was free. Again I climbed this almost vertical chain in rappel style. The chain ends right underneath the pass. And then suddenly you’re up. You get a beautiful view of the sea and youc an see Calvi already in the distance. In fine weather and without much wind, this is an ideal place for a lunch break. Given that the weather for the second consecutive day was clear and stable, I could (finally) really enjoy this trip. The descent is long, but without any technical difficulty. The refuge is an ocher to salmon colored building along the path itself. There is a fairly well-stocked shop and you can also find the bathroom with toilets and showers with hot water in the main building. On the upper floor there is also a shower and toilet, which is less busy. Camping: 5 € avoid the places behind the hotel Le Chalet because of the fan noise. I don’t know whether it functions in the evening. Bread (large): 3 € (half bread also available). Menu: 17 € Le Chalet in the evening from 19.30. Please reserve in the bar on arrival. (Large portion of soup, mixed salad, 2 pork brochettes with fries, some cheese, canned fruit salad) Wine: 9 € for a 37.5 cl bottle (no pichet available and therefore more expensive). The path starts to the left behind the refuge. First you cross the gravel road towards the holiday cottages, which you follow to the left for a short while, in order to leave it again and start to climb steeply. The climbing is hard, initially over a good path between the trees. After the first part through a trench that runs a little water and where you’ll also find the first technical passages, you turn to the right. Then follows a horizontal traverse, followed by a zigzag trail to the top. Pay attention to the GR waymarks and sometimes even use your own understanding of technical passages. The waymarks aren’t always placed along the most ideal route. People with a good understanding of climbing techniques can find better alternatives for themselves to climb. Again I which to remark that I would rather climb this than descend it. Eventually you will reach the formerly notorious suspension bridge of Spasimata. In the present time, the transverse ramps are made of galvanized metal. Still, they are quite far apart (about 20cm), which results in the fact that you can slip of the ramps with your feet. And there is no safety net provided. (Very dangerous for small children). At the bridge there is a sign stating that you shouldn’t cross it with more than 2 people at a time, but one by one seems a lot safer to me. Leaving the bridge, you will find many cables and chains over the inclined plates leading towards the intersection of trails to the hut and Bonifatu, given the fact that many day tourists visit this place from the parking lot below and given the fact that those people are usually less experienced than the average GR 20 hiker. The hut itself is situated a bit higher up, beyond this intersection in a wooded area. The descent to Bonifatu is quite eroded and therefore rocky, which makes it hard when combined with traject12a, but does not provide any technical difficulties. The way marks are double yellow lines. You will pass 2 bridges, the lower one being a suspension bridge (GR20-12V12 Ruisseau de Meta Di Filu), which makes a fine photo stop. I was amazed at the number of tourists who hoist themselves to the in the oppressive heat between 12.00 and 13.00, while they should be doing this from 7.30 when it is still nice and cool. But yes …. some clearly prefer to lay around in their bed above a pleasant climb in the morning cool air. From the path towards the refuge d’Ortu di u Piobbu (GR20-12V13 D251), the path changes into a relatively flat gravel road, closed off by a barrier. At the Maison Forestal de Bonifatu (GR20-12V14 – 540m) you will find a lodging, restaurant and parking lot (3 € for cars, 5 € for campers). From the parking lot you will find the orange markings of Tra Mare e Monti. Follow this road downhill until you reach after 15 the sign on the exit of Tra Mare e Monti (GR20-12V16 Exit D251) at the height of a small parking space and a striking rock. The path descends here in zigzag down towards the riverbed and follows it towards the concrete bridge over the river (GR20-12V17 – many signs). Here you cross the river and follow the road (few waymarks) that slowly gains altitude until you reach a junction (GR20-12V19) with a road that rises further. Here, you take the road that turn to the left (waymarks) and continue at about the same altitude until you reach a T-junction (GR20-12V22), where you leave the road and take a path that continues in the same direction (wooden arrows and waymarks). For sometime, you could observe the further course of the path if you look out for a pass with pylons. The path is clearly visible in the landscape. Locally, everything is neatly marked. From the pass, you can finally see Calenzana. First you descend to the junction with the GR 20 (GR20-1307). Then you follow the common waymarks to the left. At the outskirts of Calenzana the GR way marks end. You follow the downward road (called A Torra) towards the bar-restaurant GR 20. Here you reach the D151 (U Fondu). You follow this road to the left and continued past the Spar and the gas station until the first paved road to the right. Here you will find the entrance to the municipal lodge and camping. 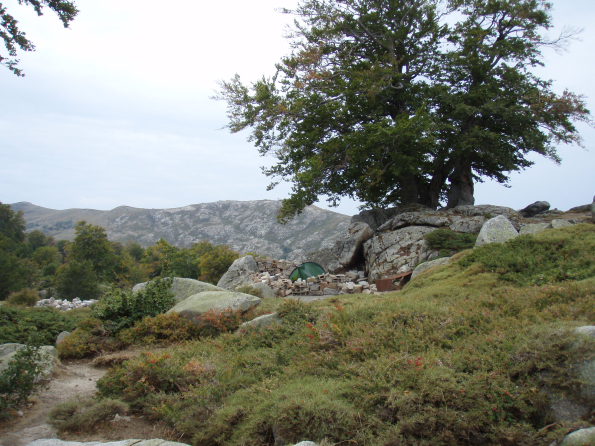 You will also find the information center of the Parc Naturel Régional de Corse. Sanitary: showers and toilets with no toilet seat or toilet paper. Sloppy maintenance for the price. Kitchen with electric stove and microwave and dining room (light stays on overnight and is disruptive to the campers who pitched their tent before the stream. Beyond the brook, you are even closer to the main road. Bowl of mixed salad with croutons, spaghetti with stew of wild boar. Crème Brulée. Hikers who chooses the GR20 and walk it in the south-north direction, can double up certain stages in good weather. To triple stages seems risky business and in emergency situations a choice for the Tra Mare e Monti trail is to be advised. 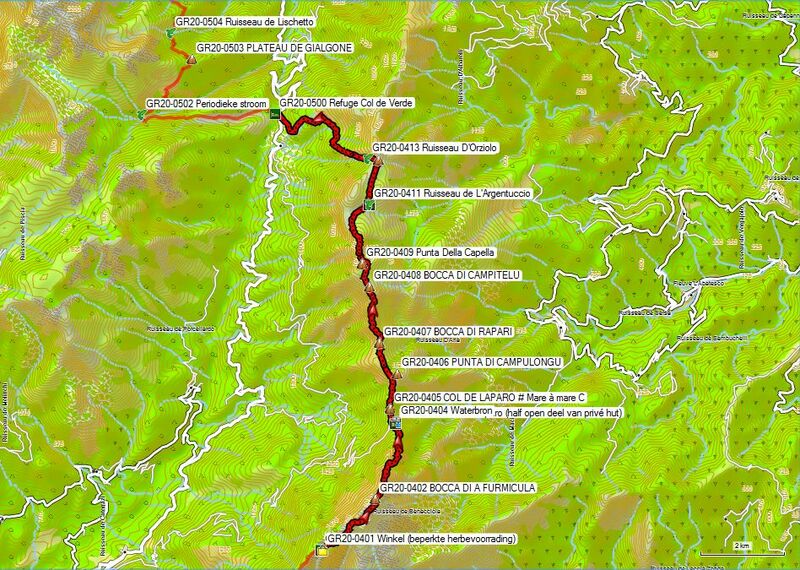 The GR20 trail starts at the last building of the refuge in a northeasterly direction and slowly proceeds towards a feeder river of the Rau Spasimata. After crossing the riverbed, the percentage of inclination rises. First, the path continues to follow the river, to continue by climbing through a trench in a northern direction. Again this section should be considered more pleasant to climb then to descend. You reach the Bocca Carozzu ou Inuminata (GR20-1211). You climb further in a northeasterly direction to a height of 1930m, then to start the descend towards the saddle Bocca d’Avartoli (GR20-1212). Through the eastern flank of the mountain, the path descends then to return to the actual Bocca d’Avartoli. From the saddle, the trail climbs further into the flank of Cappu Ladroncellu (GR20-1215 – 2145m) to a highest point of 2020m (GR20-1214). From this point you descend in a number of inbetween climbs towards Calenzana. 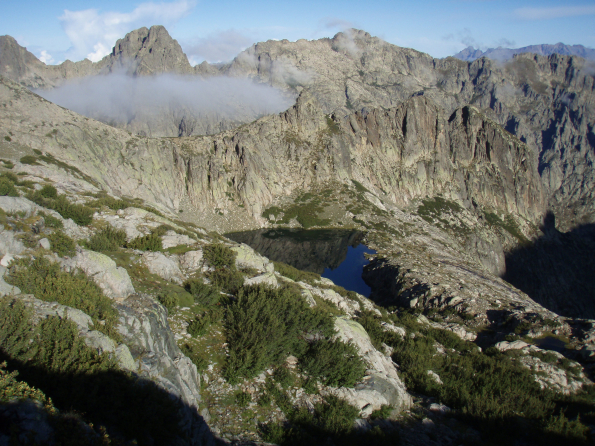 From this highest point, you will descend westward to the Bocca Piccaia (GR20-1216 – 1950m). From the pass, you first descend in large, later smaller zigzags down, into the bed of the Ruisseau de Mandriaccia (GR20-1217). 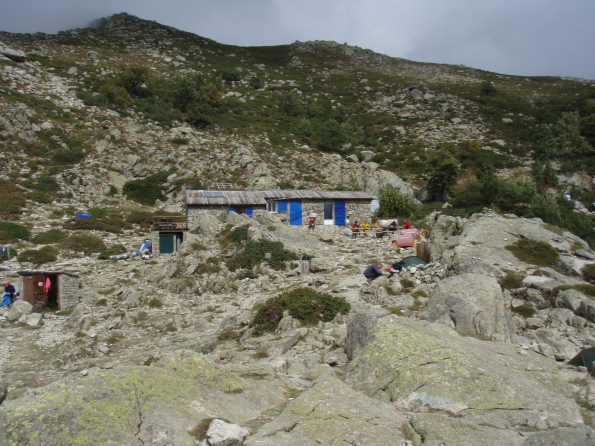 Then it goes up and down towards the Refuge d’Ortu di u Piobbu (GR20-1300), for many GR20 hikers their first hut. The cabin is well known for its large library consisting of left behind books by inexperienced hikers. This again sketches the fundamental problems of the GR 20: despite the fact that this is the hardest GR in France, it is often chosen as a first target by many hikers. A slow and modest buildup of knowledge and experience stands in sharp contrast to these times in which self-glorification (selfie) and social competition (Facebook) apparently have become the norm. 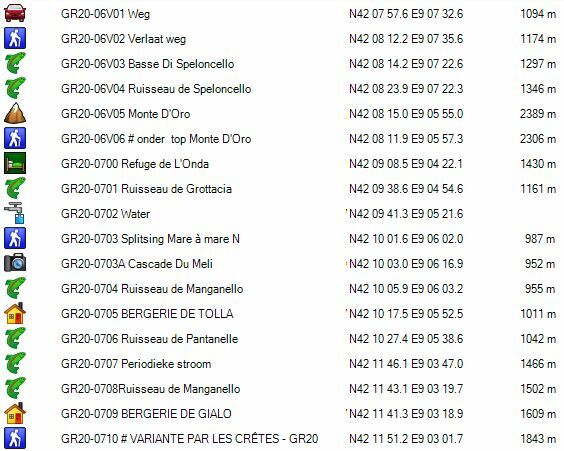 Everything has to be spectacular, and especially accident statistics on the GR20 are exactly that. From Refuge d’Ortu di u Piobbu (GR20-1300) the trail goes up and down, while rounding the bowl of the Ruisseau de Melaghia (GR20-1301). Right across , at the other side of the bowl, you reach the Bocca a u Bassiguellu (GR20-1302). From this pass the trail goes eastwards through rocky terrain down in the slope of the Capu Ghiovu (GR20-1303). This is possibly the only place where the north-south runners experience some advantage, but their backpacks are heavy and yours is light now. You also have been able to build up sufficient experience, which works in your favor. You descend to the treeline, to start climbing again towards the last pass, being the Bocca a u Saltu (GR20-1304). From the pass, you descend in zigzag until the Promontoire D’Arghioa (GR20-1305), a kind of vantage point over the lower river, Ruisseau D’Arghioa (GR20-1306). You will continue to descend towards the Ruisseau de Sambucu (GR20-1307). And from there you descend even further to just below the pass with the Carrefour des Sentiers (GR20-1308). Just before the pass, you will need regain some altitude to reach the pass itself. Just behind the pass, the GR20 & Tra Mare e Monti join, to descend from here together towards Calenzana (GR20-1400). I woke up at 04:30′ am. Because of the noise here, I didn’t get much sleep. At 05:30’am I was ready to leave. By 07:00′ am I was standing at the train station of Calenzana Lumio. You reach this by walk down the D151 to the roundabout with the N197. Here you turn right direction Lumio. After 700m, just past the petrol station and opposite the entrance of the army barracks you will find the boarded-up station building of Calenzana Lumio. You can hardly imagine that the train is actually going to stop here, but it does. The timetable of the summer was extended until 21/09/09, but since I left on 26/09, it was presumably no longer valid. When I left home I checked the internet, but couldn’t find the new schedule. The train was under the old schedule scheduled at 08.45′ am, but arrived at 08.15′ am. Raise your hand and the train stops. The conductor produced a ticket to Bastia on his little computer for 15.80€ and immediately informed me of the fact that I had to switch twice. Normally you switch in Ponte Leccia to another train to Bastia, but now this was a great coach because of major works on the track. In Casamozza we switched back to the train to Bastia. My flight back home left at 8:30’pm and I did not feel comfortable with the idea of having to sit all day in the airport building, as this is very small airport with limited facilities. So instead of abandoning the train at Lucciana and continuing on foot towards the airport, I continued to Bastia (terminus). There, I spent most of my time hanging around on the Place Saint Nicolas overlooking the ferryport. I had lunch on the terrace of L’Imperial (pizza restaurant). I had the Pizzaiologa at € 11 and a bottle (50cl) of red Patrimonio for 6 €. Both pizza and wine were very tastefull, the pizza could have been served a little warmer. At 5.40′ pm, I took at the Prefecture opposite the train station, the bus to the airport. The bus takes about half an hour and the ride will cost you € 8.50, which is costly. The flight departed on time and arrived about half an hour earlier in Brussels. Given the SNCB is not friendly enough to offer it’s end of the day customers a ride from the airport to the big cities of Belgium, I had to appeal to family members to pick me up there (last train to Ghent 10:17′ pm). 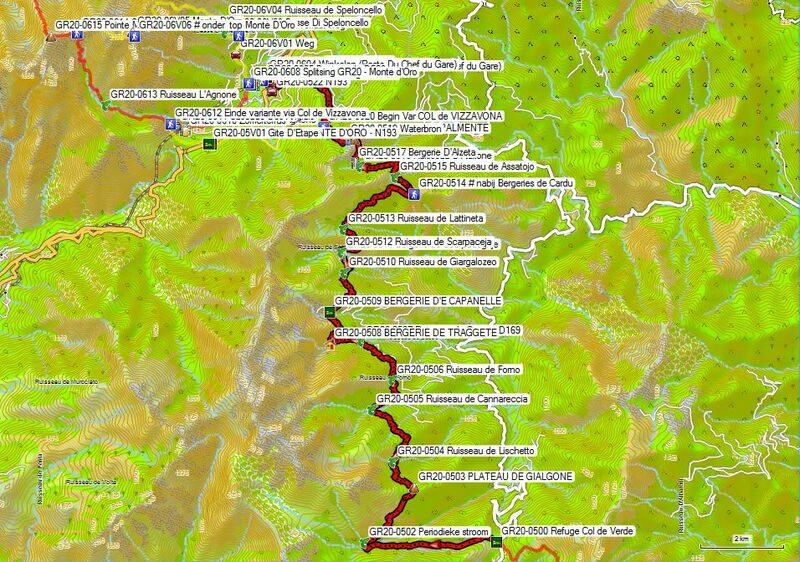 The GR 20 is called the toughest GR trail of France. There is something to be said about this. This fact is largely determined by the still weak and mostly unpredictable logistics (supplies in the cabins). I have tried to make reservations in the refuges over the Internet, but I did not succeed. Others reported to me that they were successful. Know that if you opt for the refuges, you will experience what it feels like to be living like sardines in a can. You will have to take potluck for dinner. This comes almost always from cans and is inexpensive in terms of ingredients, but is sold at firm prices. Even if you opt for hotel accommodation whenever it’s possible, you will have to take whatever there is, at the prices they ask, and that doesn’t come cheap. More expensive it becomes, if you choose for guided tours, especially the ones with luggage transport, owing to the high labor intensity of transporting the luggage (descend by mule, transport over the road by van and back up by mule again). Concerns I have especially because of the absence of technical tools and security devices in difficult passages along the trail. Looking at the quality of equipment used by many hikers, I suspect that most French citizens underestimate the difficulty of the GR 20 and therefore do not possess the necessary level of climbing skills to move in a safe manner in terrain with multiple technical difficulties. 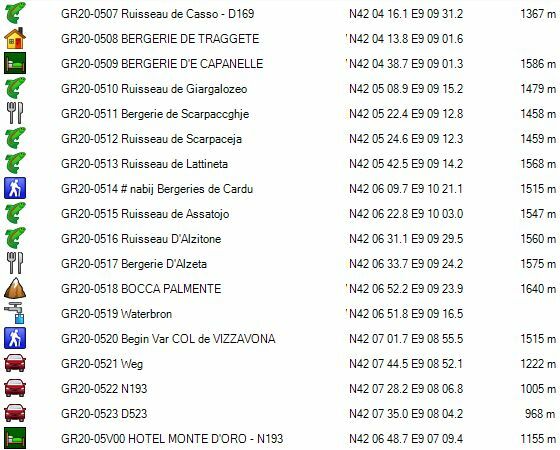 I have found no figures on the number of accidents on the GR 20. Five Flemish hikers which I met along the way, did tell me that the first day they came across a person with a broken arm and the second day they themselves notified the police on a lady with a broken foot . 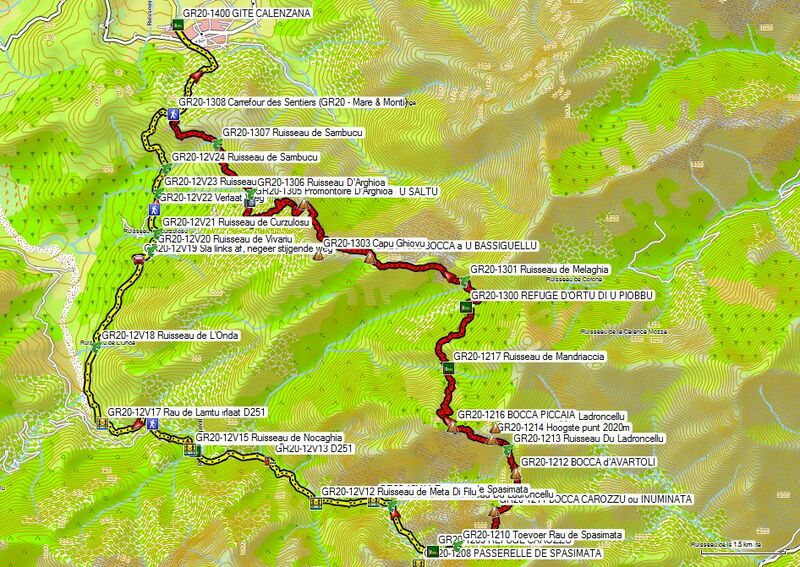 If after reading this report still, you still opt to walk the GR 20 from north to south, you are in my opinion an idiot (Sorry for the harsh words).